Last week I wrote about how AppsFlyer leverages its scale of data to fight fraud with machine learning. The post described how and why, thanks to our scale, we are able to quickly identify new forms of fraud, and automatically immunize our entire client base against them. This post will focus on another important aspect to size – having a significant market share. Unfortunately, in the mobile marketing ecosystem, fighting fraud is widely talked about, but when it comes to actions rather than words, no one has a real incentive to truly fight back. As a result, fraud is prevalent. This is about to fundamentally change, so stay with me. In the wild west of mobile advertising, ad networks have little motivation to clean up their inventory from fraud. Yes, there are networks actively developing anti-fraud measures, but there are others that might prefer to ignore or even promote fraud! When this happens, the legitimate ad networks are outperformed in the ROI they deliver to marketers. After all, why would marketers buy an app install for $3, when they can get the ‘same’ install for $0.3? In particular, this is extremely harmful with new types of fraud, in which fake or hijacked users have a much higher LTV and ROI than real ones. 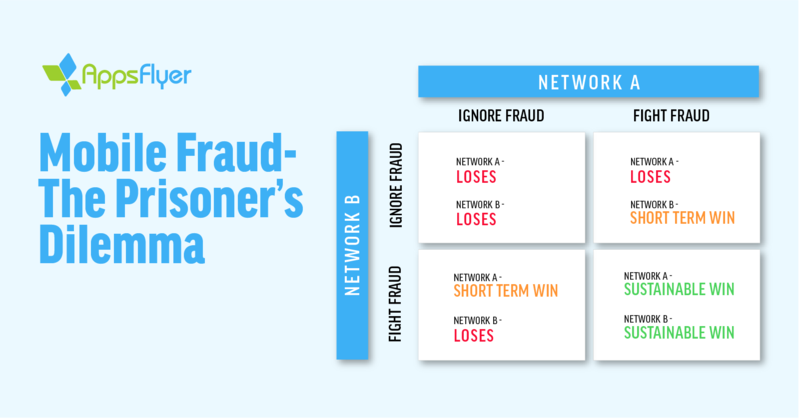 In a hyper-competitive environment, legitimate ad networks might be forced to lower their standards in order to compete with fraudsters’ fake ROI. Instead of eliminating fraud coming from fraudulent publishers and dubious affiliates, networks might be pushed to turn a blind eye so they can remain competitive – even at the price of sending fraudulent traffic to their marketers. Everyone is committed to fighting fraud → Sustainable win/win scenario for everybody (excluding the bad guys); market transparency and trust increases leading to rapid growth in marketing spend. Clearly, only option #4 is a sustainable ‘win’. Others are short-term wins that will quickly turn into losses. While it is the responsibility of ad networks to make sure they are not sending fraudulent traffic to their clients, we take action. In the past, we actively removed several ad networks from the AppsFlyer platform because we had reasons to believe that their main business was to perpetrate fraud. Naturally, they were very upset about our decision and did everything in their power to prevent it. But ultimately we have one goal – to make our clients successful! This is one of the core advantages of being truly unbiased. Our entire revenue comes from our clients, the marketers. We do not sell anything or have any commercial transactions with our media partners whatsoever, while other attribution providers sell products (or even worse – sell data!) to both publishers/networks and advertisers. These transactions are creating a clear conflict of interest that is holding them back from really fighting fraud rather than just talking about it. Would biased attribution providers be able to fight and remove fraudsters who are also their paying customers? It seems crazy, right? With AppsFlyer’s Protect360, which includes our big data and the world’s largest fraud anomalies database, we are uniquely positioned to detect issues and ensure the AppsFlyer ecosystem is clean. Since actions speak louder than words, we have decided, as the Attribution Authority, that we are going to regulate the AppsFlyer ecosystem and will remove bad actors from our platform in order to protect our clients – the marketers. 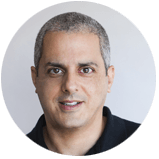 As such, we are going to constantly review and audit all of our integrated ad networks, ensuring they are aggressively doing everything in their power to minimize fraudulent traffic being sent to AppsFlyer clients. Having 60% market share is very powerful. With power comes responsibility, and we will do everything we can to protect our clients and the industry. I therefore advise ad networks to start clamping down on fraud and stop working with bad publishers and affiliates. Let’s not be naive, if it seems too good to be true, it almost certainly is. We need to make sure fraudsters go out of business and legitimate players flourish. If we refrain from taking action, fraudsters will thrive while legitimate players will disappear together with the entire industry. Is your attribution partner working for you or for specific ad networks? Does your attribution partner have any conflict of interest that might stop them from effectively fighting fraud? Does your attribution partner sell data for a living? Does your attribution partner have the scale to enforce a clean environment, and to make your ad networks think twice before they send any fraudulent traffic your way? As a final note, let’s go back to the prisoner’s dilemma. 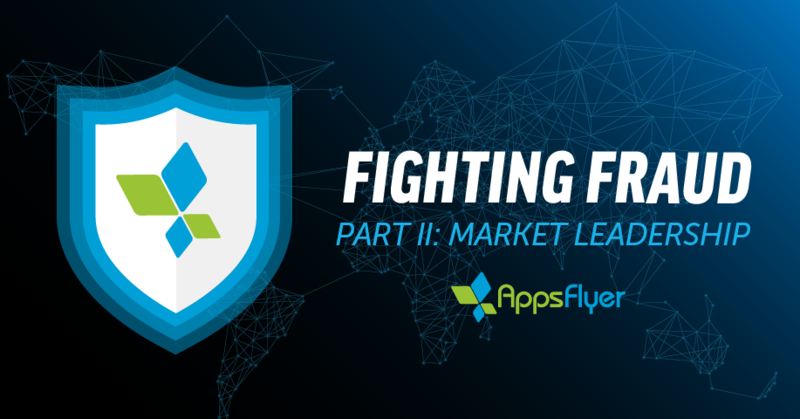 I have a message to all of our integrated ad networks: as far as AppsFlyer clients are concerned, you are now fully incentivized to actively fight fraud. We will ensure that all of our partners do the same. By taking action and raising the standards, AppsFlyer is committed to creating a sustainable win/win scenario for our clients, our integrated media partners, and the industry.